Vzdálené ovládání a zobrazení nádherného UltraHD/HD videa (nekomprimovaného) z RovoCam pomocí RovoRX-SDI a RovoControl. RovoRX-SDI je UltraHD/HD HDBaseT přijímač pro RovoCam. Podpora vyšších zobrazovacích frekvencí HDBaseT, integrované čtyři 6G/3G SDI výstupy, HDMI a audio pro UltraHD a HD workflow. Přenos broadcast videa až do vzdálenosti 100m po standardní Ethernet kabeláži (CAT 5/6) včetně ovládání a napájení kamery. HDBaseT na RovoRx-SDI podporuje uncompressed video, audio, nájení, ovládání vše pomocí jednoho Cat 5e/6 kabelu, což značně redukuje kabelové rozvody a zjednodušuje integraci. Rx-SDI umožňuje pracovat v DA módu při přenosu z HDBaseT zdroje. Přenos nekomprimovaného videa, zvuku, napájení a ovládání pro RovoCam až do vzdálenosti 100m na běžné CAT5 kabeláži. 4x 6G/3G SDI, 8-kanálů embedovaného audia, mód distribučního zesilovače, genlock. RovoRx-SDI offers a lot of power for HDBaseT workflows, receiving uncompressed video and audio, offering bidirectional VISCA support and PoH for powering RovoCam, all across a single Cat 5e/6 cable. 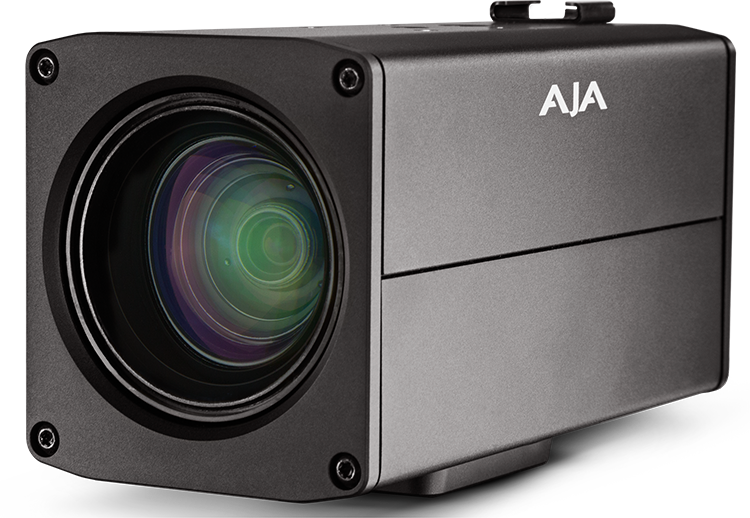 With multiple 6G/3G-SDI outputs as well as HDMI, your options for distribution of RovoCam's UltraHD or HD imagery simplify any project's needs. 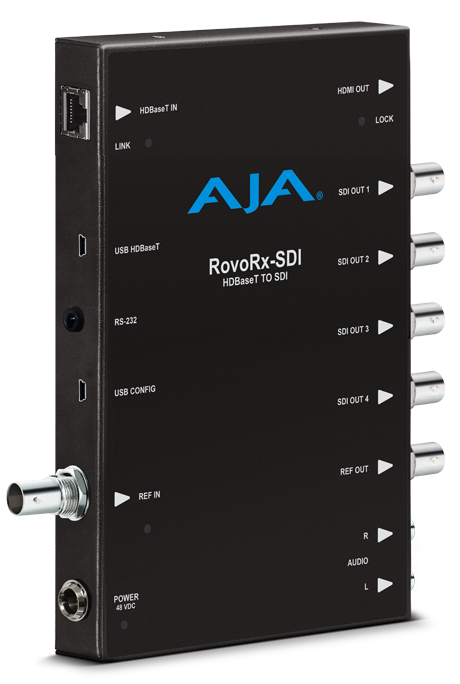 RovoRx-SDI uniquely offers a DA Mode for Distribution Amplification output of incoming HDBaseT video sources. 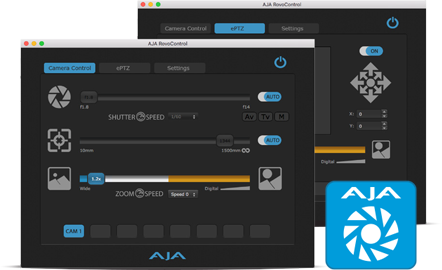 DA Mode allows one HDBaseT video source to be output via multiple 6G/3G-SDI connections, opening up the opportunity for simultaneous recording, routing and display of RovoCam imagery. PoH or Power over HDBaseT is a lifesaver for those working on live events, in studios and other signal sensitive environments. By supplying RovoCam's power from a remote location, signal interference is mitigated and cabling is greatly simplified. 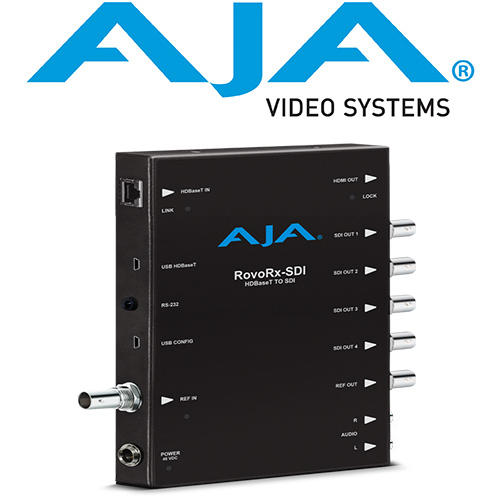 RovoRx-SDI can provide power to RovoCam or to third party HDBaseT transmitters, all across a single category cable alongside video, audio and control signals. 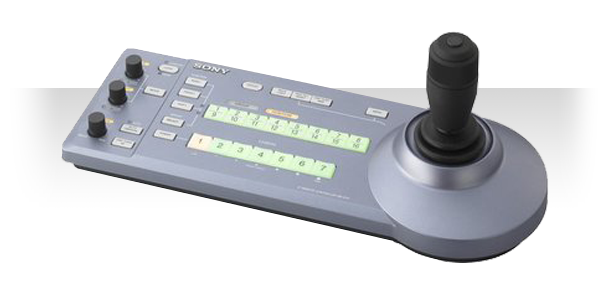 The RovoCam camera features an integrated HDBaseT transmitter. Not only does HDBaseT offer affordable long cable runs up to 100 meters over standard Cat 5e/6 cables, it also passes RovoCam’s beautiful UltraHD/HD imagery, audio, control of the camera, and power to the unit. • Simple to Install. Simple to Operate. Note: Power and RS-232 connections on RovoCam are not needed if those functions are supplied by the HDBaseT interface. 4 x 6G-SDI v "DA Mode"